You all know by now that we at UpdraftPlus are committed to continually developing and improving our (already super) plugins. Today, we’re thrilled to announce that UpdraftCentral is the latest plugin to enjoy a bit of an upgrade in the form of a new plugin and theme manager feature. And yes, it’s an upgrade that applies to both the free and the cloud version. As you all know, UpdraftCentral is unrivalled in its power and convenience, allowing you to backup, update and manage all of your WordPress sites from just one location. This upgrade makes all this brilliant functionality even better. It basically gives you more remote control over your websites. For starters, it allows you install and to activate any plugin onto all connected websites at once. So for example, if you have 20 websites and you want to install the ‘Yoast’ plugin on 18 of them, this new feature will do just that. You simply select the plugin, select the sites you want it installed on and voila! UpdraftCentral will do all the work in a flash! There are also a load of fixes and tweaks. We strongly recommend that all of our UpdraftCentral customers install this upgrade, so make sure you get it done today! And be sure to visit UpdraftCentral for further updates and information. Alongside the update for the free version, we’re also releasing an update for UpdraftCentral Cloud with features including a theme management module and a plugin management module (see below of the full change-log for this release). The post UpdraftCentral now allows you to install a new plugin or theme on all your WordPress sites at once appeared first on UpdraftPlus. UpdraftPlus – Backup, restore and migration plugin for WordPress. Here at UpdraftPlus we are all excited to announce that our Easy Updates Manager plugin has achieved another great milestone in hitting the 200k active install mark at WordPress.org. We are constantly releasing lots of internal improvements, tweeks and bug fixes to make Easy Updates Manager work faster and better. We would like to thank all our users for installing the plugin, our 5 star rating and all your feedback and custom. Your support enables us to continue developing the software so it continues to grow. We would also like to give you an update on the first Premium version of Easy Updates Manager. The Premium version offers users a range of enhancements and extended features that make a good thing even better. It also comes with our fast and personal support service if you ever have problems. We are working hard to make sure Easy Updates Premium will be ready soon, so be sure to stay tuned for further updates. The post Easy Updates Manager passes 200k active installs appeared first on UpdraftPlus. UpdraftPlus – Backup, restore and migration plugin for WordPress. A new UpdraftPlus release is out. This introduces no new features, but fixes a few issues or sub-optimal behaviours in the previous release (which introduced our new UpdraftClone product, in case you’ve not yet seen it). The full changelog for this release is below; but the short version is that we recommend the update to everyone. The post UpdraftPlus 1.15.2 (free) / 2.15.2 (paid) released appeared first on UpdraftPlus. UpdraftPlus – Backup, restore and migration plugin for WordPress. UpdraftPlus is pleased to announce the revolutionary new “temporary clone” service is now live. The Updraft Clone service allows you to create a cloned test site directly from UpdraftPlus settings in seconds. Want to see how your site looks with updates such as upgrades, new themes and plugins, or a new layout and content or PHP version before it goes live? With Updraft Clone it’s never been so quick to create a temporary sandbox for changes you want to try. It really is as simple as copy and paste for your WordPress site. Unlike our Migrator feature, there’s no need to worry about hosting or installation of WordPress or plugins – it’s a cloud hosted service. You simply select your preferred versions of WordPress we take care of the rest. This leaves you more time to test your site and, well, whatever you like! PS – Best of all, we’ve included free clone credits for all Premium customers so you can try the service free of charge right now. Just update to the latest version of UpdraftPlus, go to the ‘Migration / Clone’ tab in the settings page and select the UpdraftClone option. The post Major new UpdraftPlus version released: WP sandbox site setup now as easy as copy & paste appeared first on UpdraftPlus. UpdraftPlus – Backup, restore and migration plugin for WordPress. The world’s most popular slider plugin for WordPress, MetaSlider, today released a “slider block” for the highly anticipated Gutenberg WordPress editing experience. Many people are wondering how MetaSlider will work with the new platform and if we have made efforts to make the two compatible. Short answer – yes, and you can download the new release today. The Gutenberg editor is being designed to make the process of building a website in WordPress even simpler and more intuitive so that just about anyone can publish content, regardless of whether they have any technical knowledge or are able to write code. Gutenberg works by taking away the need for inconsistent ways of creating custom content, by creating various types of content blocks (e.g. text, videos, images, quotes, etc). Users are able to add blocks individually, filling each one with content as they go along and then positioning them in exactly the right position. Gutenberg will be much more in line with modern coding standards and aligned with open web initiatives. Gutenberg will soon become a part of the WordPress core, replacing TinyMCE as the default content editor on every up-to-date WordPress website. If all goes to plan, it will be a revolutionary innovation that will change everything about website-building for the better. How is UpdraftPlus adapting MetaSlider for Gutenberg? Whilst most of our plugins work on the backend, MetaSlider is meant to be inserted in the content. Our vision is to give our users the best experience when creating simple or feature rich slideshows, and to eventually allow them to manage them completely where they need them: in the editor. The traditional short code method still works, but it’s not very user friendly. With the arrival of Gutenberg, managing complex content doesn’t have to be done using complicated sub-programming anymore. We can insert a block, and voilà, a slideshow is a couple of clicks away, just like a simple image or a paragraph of text. We’ve been following Gutenberg’s progress closely, testing and reporting bugs, and we’ve now released our first version of MetaSlider to include a Slider Block for Gutenberg. The MetaSlider block allows you to easily add any of your existing slideshows anywhere on the page, and to preview them inline with your post, like you would expect. No more copy-pasting of short codes. Insert a block, select the slideshow from the list, and the preview loads. While allowing users to manage their slideshows from the editor is our aim (e.g. add and edit slideshows), it will take Gutenberg some time to become mature, and we want to wait further to include more powerful editing functions to our block. An added feature of MetaSlider Premium is the ability to add a scheduler slider that will activate and deactivate on the dates of your choice. For example, if you wanted to showcase a seasonal holiday, you could automatically schedule a Christmas slider to appear on your site every year in December. A spokesman from MetaSlider said “we’re continuing to work hard on MetaSlider, adding great features and improving existing ones. We’ll also shortly be launching the concept of Slider Themes where you can change the look and feel of a slider in one click“. 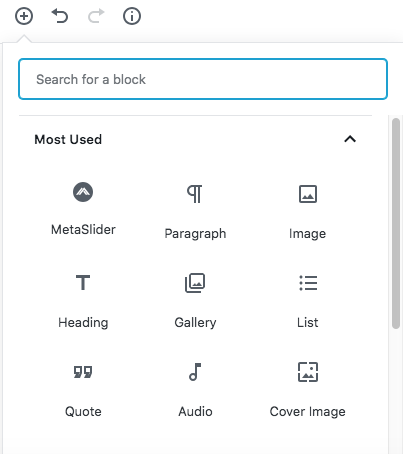 The post MetaSlider introduces ‘slider blocks’ for Gutenberg appeared first on UpdraftPlus. UpdraftPlus – Backup, restore and migration plugin for WordPress.